Item shown above : BLACK Finish, Softballs, Cubes and baseballs are NOT INCLUDED. 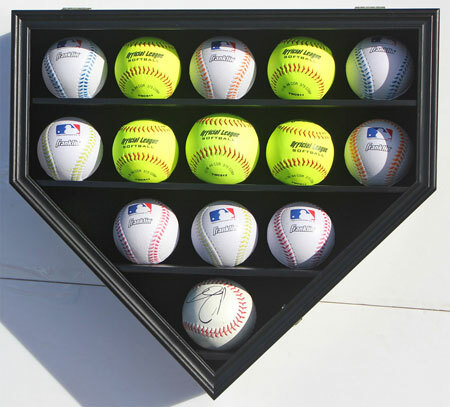 DisplayGifts solid wood display cabinet to hold 14 12" Circumference softballs, as well as Baseballs in 3" square cubes. It can also hold regular baseballs. You will just have extra room between shelves though. Indentation on the shelves to prevent the balls from rolling. UV protection acrylic door to prevent dust and protect. Metal brackets already on the back makes it hanging for hanging. Felt interior background. Interior depth is 4.25". Shelf Height is 3.75".